Every Footy Jumper has a story to tell . Stories like , it was Uncle Berts which he wore during the tussle for the 1939 premiers flag . This old woollen jumper , has been in the family since the 20's , and has been passed down to the oldest boy in the family ever since . My second cousin , twice removed , bought this for me at Ball and Welch Emporium in Swan st , Richmond , in the 60's . See this dark mark , Royce Hart bled on it . A damp patch where Ben Cousins cried . More poignantly , a Fitzroy jumper was used to bind the Kelpie dog's leg , after he was run over in busy st georges rd , and had to be rushed to the Lort Smith animal Hospital . We found this Saints jumper in the bottom of my grandfathers wardrobe , its a beaut vintage number , free of moth holes . Bruce Doull played in this , I'm sure John Coleman had one like this and Paul Roos led the last Fitzroy team in this . Most recently the jumpers stories run along the lines off , see this signature , its Buckley 's on the day he retired . This is the Bombers guernsey that Hirdy touched as he ran off the field when we beat Collingwood , ten Anzac Day Games ago . This colourful jersey is the one depicting the Dreamtime theme of the AFL indigenous round . 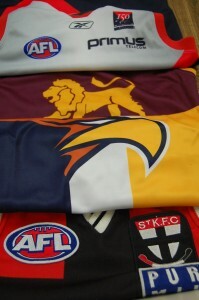 A jumper has the special Grand Final Logo , or the commemorative insignia worn to celebrate the Melbourne Football Clubs 150 years of playing footy . Lenny Hayes cried in a jumper just like this when we lost the Grannie to the Pies ! Little kids love their footy jumpers so much they want to sleep in them ! Proudly worn on match day , and any old time , they are cherished , loved and prized . Often passed on from generation to generation , or shared with others . Remarked upon , criticised , joked about ,but never ignored . Part of Aussie folklore , you bet ! This entry was posted on Friday, June 14th, 2013 at 3:51 pm	and is filed under AFL, football jumpers, NRL. You can follow any responses to this entry through the RSS 2.0 feed. Both comments and pings are currently closed.